The “Two Towers” Seminar was held in Trani, Italy, on June 6-7, 2013. S.M.ART. BUIL.T. partners representatives participated in a high-quality scientific action, giving presentations and exchanging ideas and thoughts in various aspects that are related to the project. 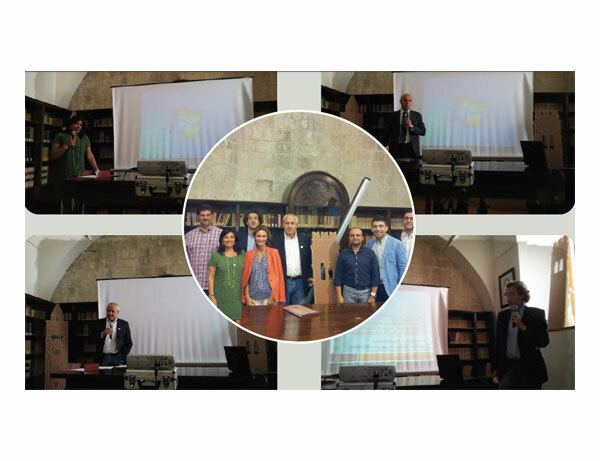 More specifically, Mrs Tatiana Bianca (MIBAC) gave the first lecture on the results of the research on the old town’s evolution and seismic history of the city of Trani. Next, Mr. Francesco Tucci presented the experimental tests and FEM modeling updates for the Bell Cathedral of Trani. Dr. Nicola Ivan Giannoccaro (University of Salento) talked about the dynamic identification and modeling of the Annunziata tower, followed by Francesco Paparella that provided an interpretation of a stochastic signal for monitoring and collecting data. Last but not least, Dr. Panayiotis Vlamos from Ionian University concluded the seminar with a talk on sensor network, data collection and modeling.